Justice Antonin Scalia’s death may lead to a constitutional crisis. 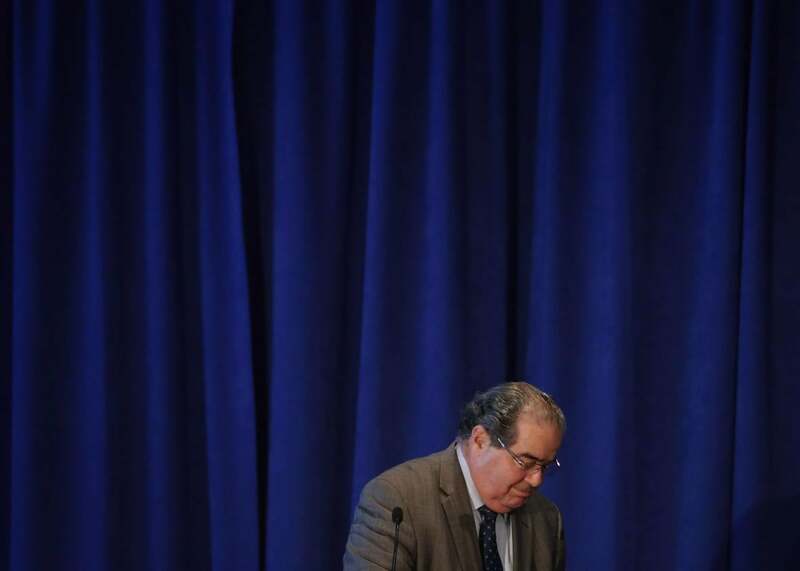 Could Justice Antonin Scalia’s Death Lead to a Constitutional Crisis? Republicans may refuse to let Obama fill Scalia’s Supreme Court seat. Supreme Court Justice Antonin Scalia ain 2014. Just 30 minutes later, Texas Sen. Ted Cruz chimed in to say the same. “Justice Scalia was an American hero. We owe it to him, & the Nation, for the Senate to ensure that the next President names his replacement,” he said on Twitter. Scalia’s death was an incredible shock. This conservative reaction is not. The last Supreme Court Justice to die in office was William Rehnquist, who passed away on Sept. 3, 2005. By the end of the month, President George W. Bush had picked his replacement—John Roberts of the D.C. Circuit Court of Appeals, originally named to fill Sandra Day O’Connor’s seat—and the Senate had confirmed it. In theory, we could move at the same speed. There is no question the Obama administration has a short list for Supreme Court appointments, and there’s nothing in the Constitution that precludes a president in his final year from selecting an associate justice for the court. After all, a president doesn’t disappear after seven years. Barack Obama is still the legitimate executive of the United States government with all the authority that brings. But modern American politics is a polarized place, and there’s a stark ideological divide between liberal and conservative jurists. To replace a Republican appointee like Scalia with a Democratic choice is to transform American jurisprudence, pulling it back from the conservative turn of the past 30 years, and swinging it to the left. If the 2014 elections were different—had Democrats turned out to save the Senate from a second Republican wave—then President Obama and his allies could have played a repeat of 2005, quickly bringing a new justice onto the court. But the Senate is held by a firm Republican majority. And unless it wants to immolate itself in the flames of conservative fury, that majority will block Obama’s nominee, regardless of skill, belief, or reputation. The stakes are so high that Obama could nominate the ghost of Thurgood Marshall turned flesh and the Republican Senate would reject him as a matter of course. Instead, as per Carroll, Cruz, and Cooke, we’ll have to wait until 2017, when the Senate swears in a new president. For Republicans, this is a rational choice. By every measure, this year’s race is a coin toss between Republicans and Democrats. But even a coin toss brings better odds than letting Obama cement his legacy by choosing a replacement on the Supreme Court. With that said, there are other, larger questions: Do Republicans hurt their cause by stonewalling the president for more than 11 months between now and the next administration? Does it give Democrats space to run against GOP obstruction and emphasize the stakes of a Republican president for reproductive rights, civil rights, and labor? And what happens if the next president is Sen. Bernie Sanders or Hillary Clinton, along with a Democratic Senate? Do Republicans concede and allow the president to choose a replacement? Or is the GOP so ideological and so polarized that it refuses to budge for a Democratic president, even in the face of an election? In which case, Scalia’s death might set the stage for the first constitutional crisis of our young century.